A top Justice Department official tasked with reining in corporate crime and upholding accountability standards has resigned, citing "conduct at the top"—a thinly veiled reference to President Donald Trump and his staff—that made her job impossible. 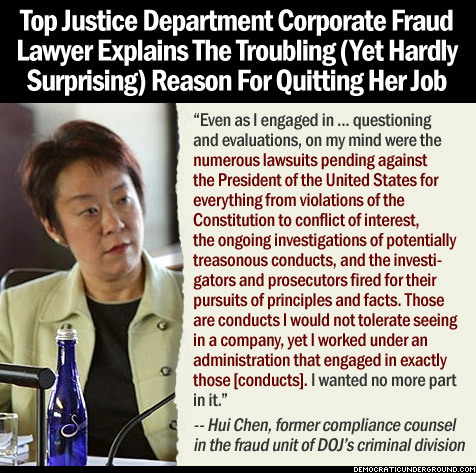 Hui Chen was hired as a "full-time compliance expert" (pdf) in the Justice Department's Fraud Section in 2015 following a career as a federal prosecutor. She had also previously worked as a compliance officer with several major companies. On Twitter, Chen frequently expressed frustration with the inner workings of the Trump administration, particularly following the firing of former FBI Director James Comey in May. "I am not willing nor able to compartmentalize my values as an [ethics and compliance] professional, a citizen, and a human being," she wrote. Earlier this month, Chen announced that she would attend the March for Truth, a rally that called for an independent investigation into the Trump administration's ties to Russian officials. "Yes, I am pro-truth, pro-democracy, and pro-earth, and will stand, march, and fight for these values," she wrote. In a recent LinkedIn post, first highlighted by David Sirota of the International Business Times, Chen announced that she had finally decided to leave the Department of Justice. Explaining her decision, Chen wrote that "trying to hold companies to standards that our current administration is not living up to was creating a cognitive dissonance that I could not overcome." "To sit across the table from companies and question how committed they were to ethics and compliance felt not only hypocritical, but very much like shuffling the deck chair on the Titanic," she added. "Even as I engaged in those [...] evaluations, on my mind were the numerous lawsuits pending against the President of the United States for everything from violations of the Constitution to conflict of interest, the ongoing investigations of potentially treasonous conduct, and the investigators and prosecutors fired for their pursuits of principles and facts." Chen decided that she "would not tolerate" this kind of behavior in a company and therefore "wanted no more part" in an administration that has so casually flouted ethics guidelines. "I believe it has never been more important for every individual to speak and act on their conscience and belief," she concluded.